Recently I was asked to review a new magazine which highlights women in history. As this is right up my alley, I of course said "heck, ya" and thus received my first issue (Issue #3), which I promptly inhaled in one sitting! 'Uncommonly Lively, Odd and Clever': The Story of Caroline, England's Most Provocative Queen. Dressing Emma: Costume Designer Rosalind Ebbutt takes you behind the scenes of the new Austen Production from the BBC. Doctoring only for Men? Exploring Victorian women's quest to become physicians. No place for a Lady? 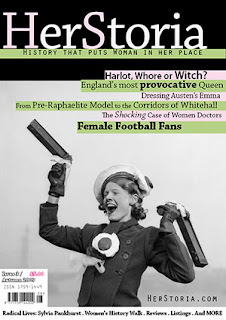 On the history of female football fans. Women's History Walk. Walking with Suffrage in Huddersfield. Harlots, Whores and Witches. Looking beyond the stereotypes. Jane Nassau Senior. An introduction to England's first woman civil servant. Radical Lives: Sylvia Plankhurst, an Activist with Attitude. I highly recommend this magazine to all of the history lovers out there! Click HERE to subscribe to HerStoria! HerStoria website. That sounds so fun! I will have to look into this magazine. Particularly about my favorite queen Caroline. I think I had heard about this magazine somewhere recently. The articles sound fabulous. I will have to check it out! Wicked cool mag. Thanks for posting. While a subscription is out for me(42 US dollars) I will try to buy the issues that catch my attention. Oooh, sounds like a super magazine. I'll check into it. This sounds wonderful! I profiled Caroline both in ROYAL AFFAIRS and in NOTORIOUS ROYAL MARRIAGES, since both her extramarital liaisons and her marriage were hideously scandalous. I also wrote an article about her for the JANE AUSTEN REGENCY WORLD magazine. She was quite a piece of work, but the more I researched and wrote about her, the more I discovered that I liked her. She was much more "sinned against than sinning," as they say. This sounds like a great new magazine!